The rains have finally arrived, putting out the forest fires that raged across Indonesia through the last few months. Forest burning takes place every dry season, but this year an especially strong El Nino phenomenon meant that the dry season was longer and dryer, and the fires were especially bad. The worst crises were, as in other years, on the islands of Sumatra and Borneo, where human pressure on the forest is high, and deep peat soils mean that fires can burn for months. However this dry season there were also significantly more fires than usual in southern Papua, in Merauke and Mappi regencies. 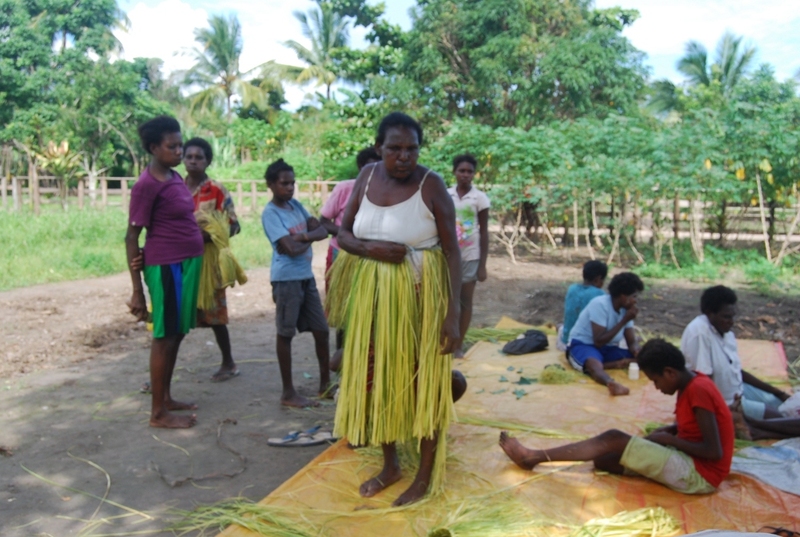 Timika, nearly 600 kilometres away, suffered from smoke haze as a result. 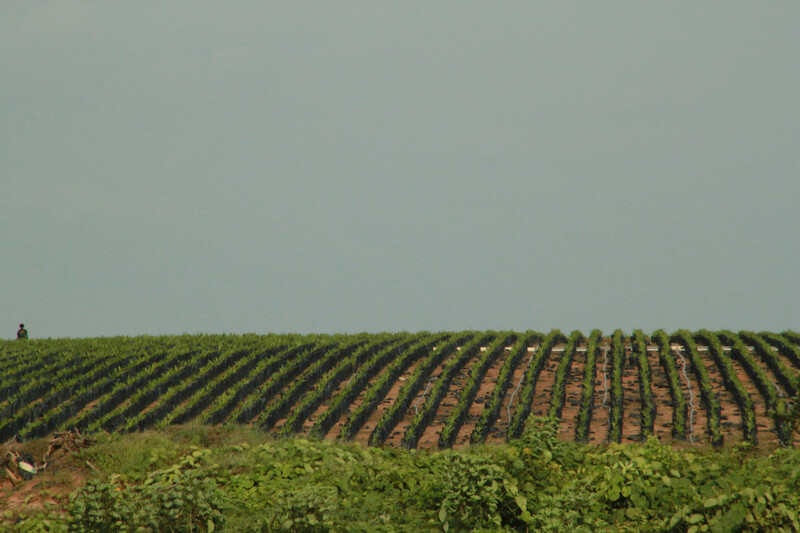 Merauke has become in recent years the main focus for the growth of industrial agriculture in Papua, due to various incarnations of a central government project, the Merauke Integrated Food and Energy Estate, and associated oil palm plantations. But is there a link between these development plans and the fires? awasMIFEE presents two articles to address this question. The first is an analysis of satellite photographs in two of Korindo’s plantations where clear evidence of fire on is found on newly-deforested land, by Sam Lawson of Earthsight. 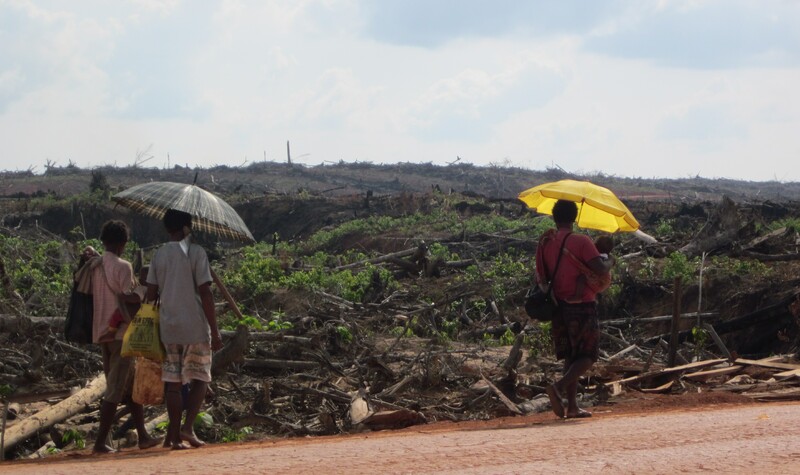 This article aims to complement that research by looking at the link between fire and deforestation in other plantations over the last four years, and the wider situation in Merauke. Many fires outside plantation areas. Fire hotspot data shows that the fires were found throughout the southern part of Merauke, where the vegetation is made up of mixed forest and grassland. 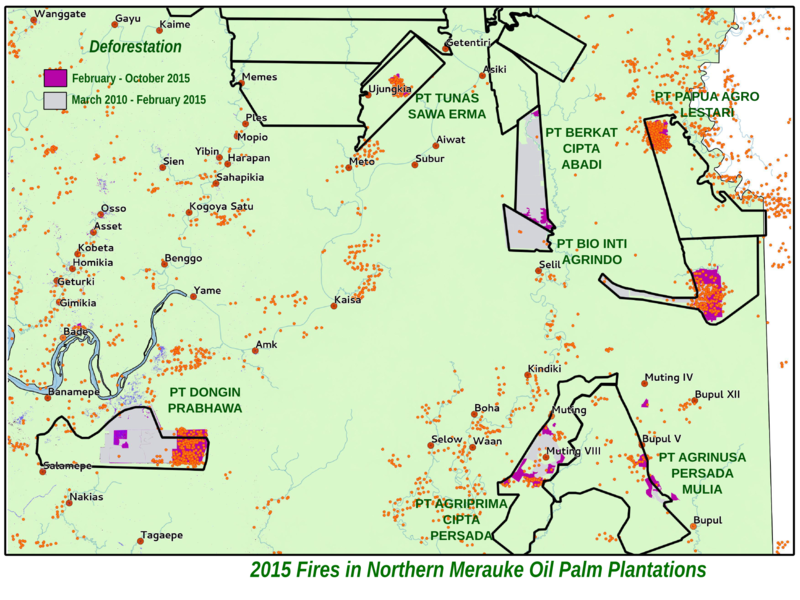 Some of these fires were within plantation concession boundaries (unsurprisingly, since undeveloped plantation concessions cover well over a million hectares, more than a quarter of Merauke’s land area). 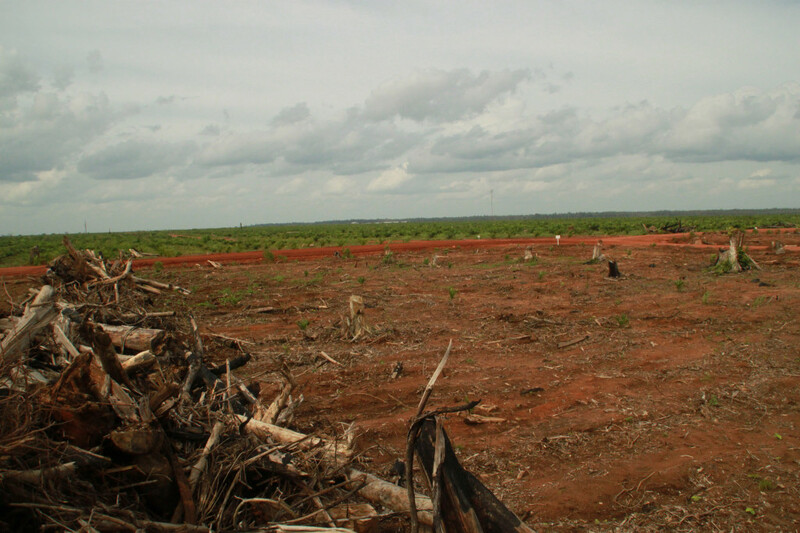 There were a few concentrations of hotspots in areas where plantation companies are known to be active (Medco’s timber plantation in Zanegi village and woodchip factory in Boepe, Rajawali’s sugar cane plantation near Domande, PT Agriprima Cipta Persada and PT Agrinusa Persada Mulia’s oil palm plantations in Muting). However, as there were also many, many other fires away from these areas, there is insufficient evidence to conclude in these cases that fires were started by the companies. Another important point is that some of the highest concentrations of fires were in areas where there are no plantations planned – such as Dolok Island, and the western part of Mappi Regency. It’s also worth pointing out that there were also a lot of fires across the border in Papua New Guinea, especially along the Fly River which flows close to the border. 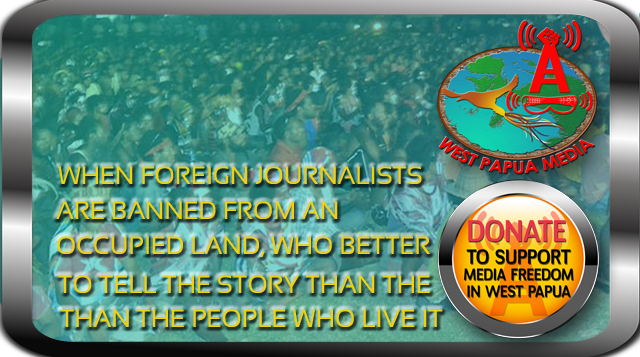 The conclusion is: while it is certainly possible that some of the fires were connected with agricultural development, the high number of hotspots outside areas earmarked for plantations means it is likely that many of them were started for other reasons. Three of those concessions are owned by the Korindo Group. PT Tunas Sawa Erma (which has been operating since 1998 but has not developed the whole concession) PT Dongin Prabhawa (which started land clearance in 2011) and PT Papua Agro Lestari (which appears to have just started clearing land in the last few months). Another is PT Bio Inti Agrindo (operating since 2012), which is owned by Daewoo International Corporation, but known to have a close relationship to Korindo. This is quite strong evidence to indicate that these companies may have been using fire to clear land, a practice which is illegal in Indonesia. This evidence is further reinforced if we look at fire data for previous years. It appears that there have been fires in the concessions each year, and the fire locations closely follow each successive year’s cutting plans. The implication is that Korindo and Daewoo International companies appear to have been regularly using fire to clear land since 2012. The following maps use a different source of deforestation data – tree cover loss data from the University of Maryland – which gives an indication of which bits of forest were cut each year, and this is overlaid with the hotspots detected by NASA MODIS satellites the same year. 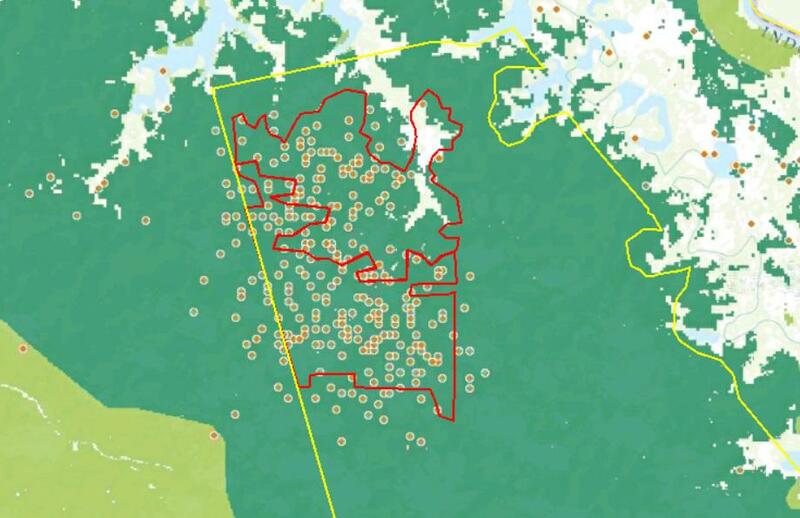 Both sets of data are available to browse on the www.globalforestwatch.org website, but due to the way that site is structured you can’t see them simultaneously like this. Here’s some views of PT Dongin Prabhawa’s concession in 2012,2013 and 2014. 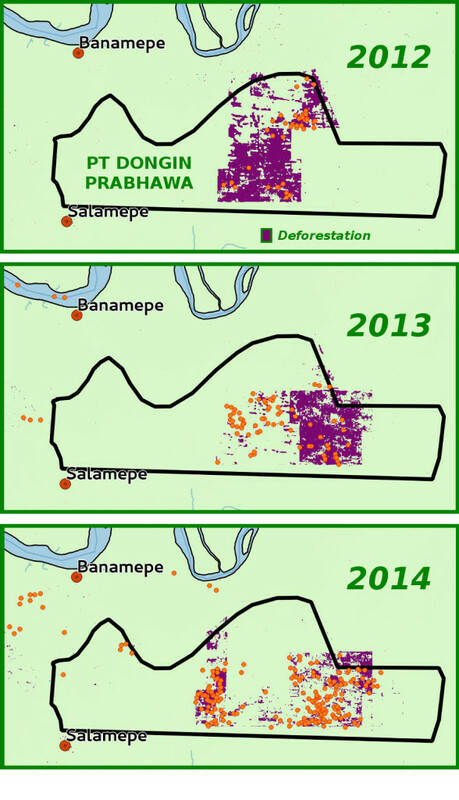 The purple areas were the areas deforested that year. The orange dots are the hotspots recorded in the same year. You can see that in 2012, there were several fires in the area cleared, in 2013 fires burned in areas cleared that year and the year before, and then in 2014 fires broke out in more newly cleared blocks. A similar pattern can be seen in PT Bio Inti Agrindo’s concession. Forest clearance started in the north-western corner of the concession, and moved eastward, including in 2014 clearing the corridor that eventually connects the larger eastern block of the concession. 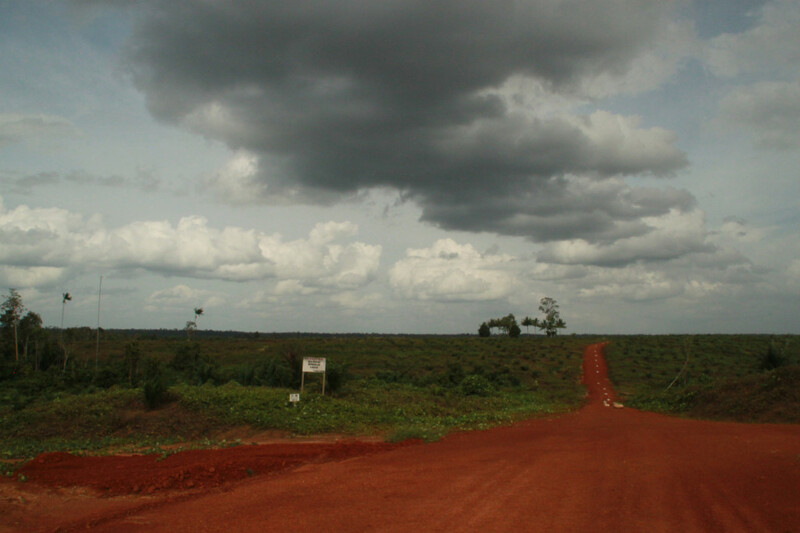 There were concentrations of hotspots in 2012 and 2013 in the western block, at the same time that deforestation was taking place there. Just to the north of PT Bio Inti Agrindo is PT Berkat Cipta Abadi, another Korindo subsidiary which started clearing in 2012. Here too, the fires closely mirrored the deforestation pattern, with a particularly high concentration in 2014. Deforestation data is from Sam Lawson’s analysis of Landsat satellites, tracing the difference between images dated late January 2015 to late October 2015. Analysis of satellite data clearly demonstrates forest fires burning in areas undergoing conversion for oil palm in two locations in southern Papua. 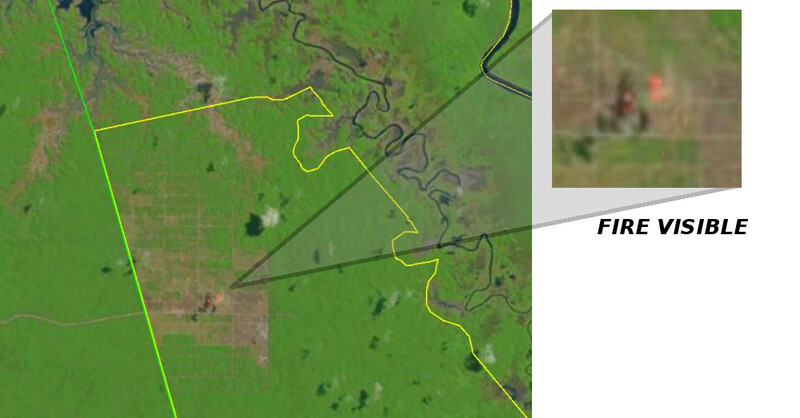 One of these areas is intact primary forest, while part of the other is on peat soil. 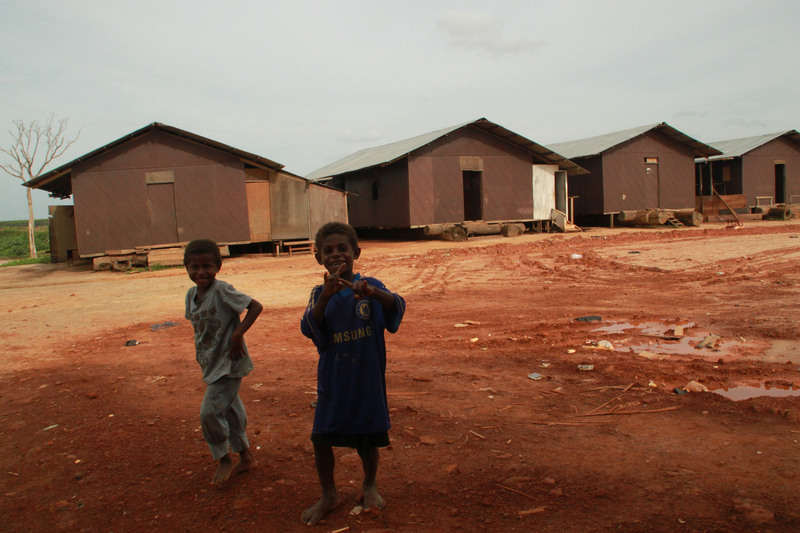 The concessions concerned are both owned by the large Korean conglomerate Korindo. 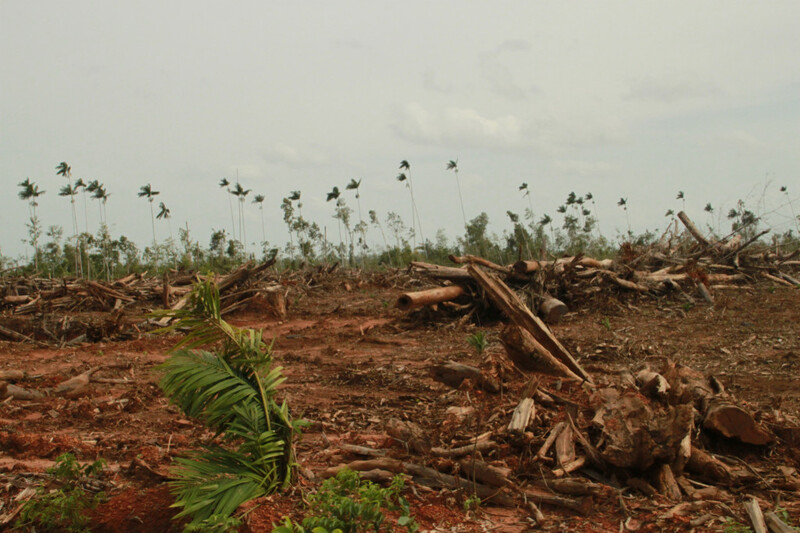 It is illegal in Indonesia for companies to clear land using fire, and oil palm concession holders are also legally required to have in place appropriate fire prevention and fire-fighting measures. Though on its own the evidence below does not prove any wrongdoing by the company or its subsidiaries or contractors, it should justify further investigation by the Indonesian authorities. 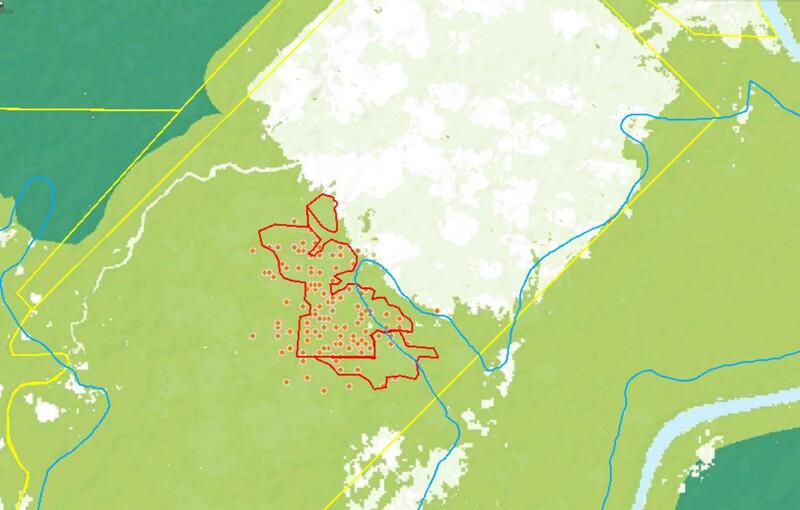 Figure 1: Southern Papua, showing boundaries of oil palm conversion concessions (yellow), forest clearance for oil palm during September-October 2015 (red) and location of case studies below. Between 1st September and 9th November 2015, more than 230 fire hotspots were detected by the NASA MODIS satellite within an area of intact primary forest undergoing plantation development near the PNG border in PT Papua Agro Lestari, Merauke district (see Figure 2). Landsat images confirm the existence of fires within this area, and clearly show how they are related to oil palm plantation development. 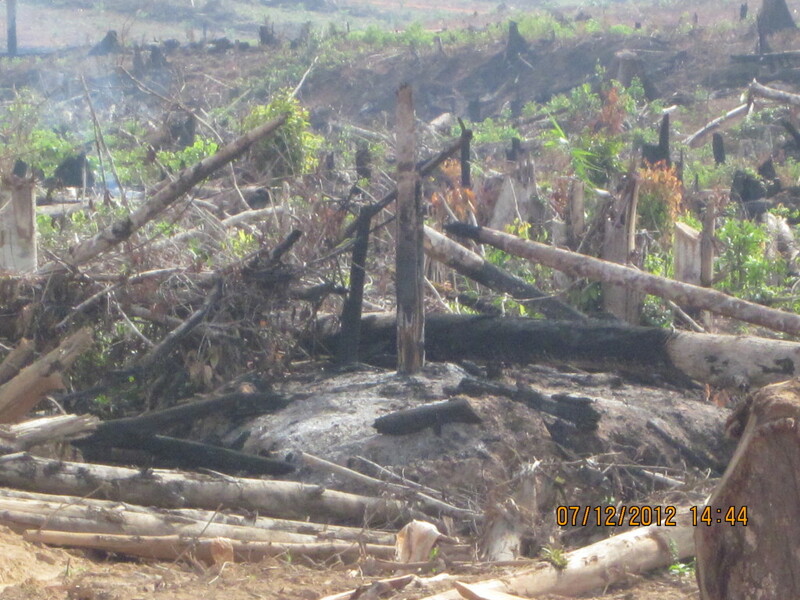 On 6th September 2015, a fire is clearly visible burning in the plantation (see Figure 4). The next cloud-free image, from 24th October 2015, also shows a fire burning, in an area which was still primary forest 7 weeks earlier (Figure 3). 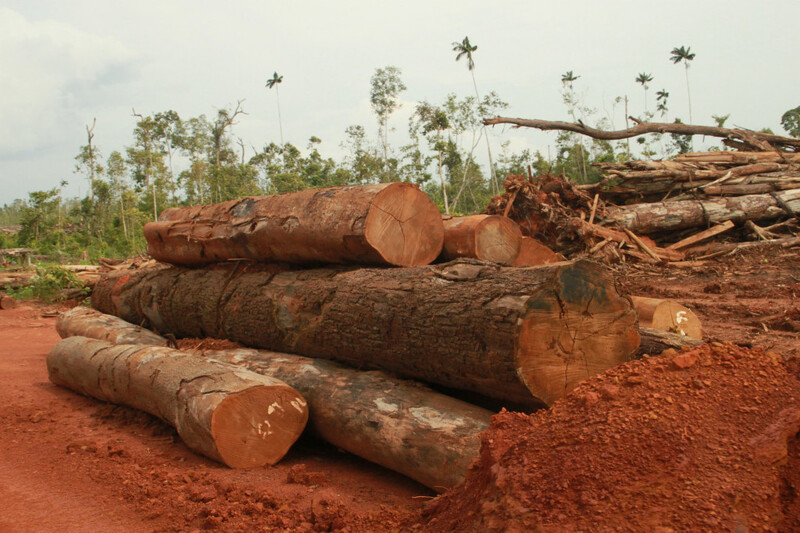 In just 7 weeks between during Sept-October 2015, 1000 hectares of primary forest were cleared, a much faster rate than could plausibly have been achieved by other means. 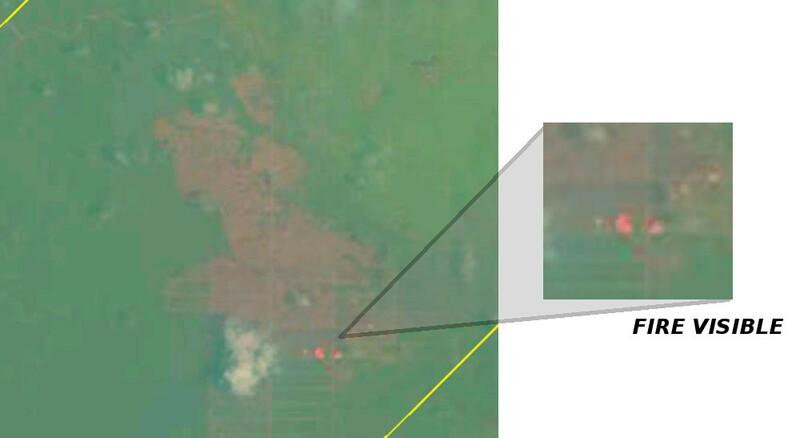 During the same period, more than 100 fire hotspots were recorded by the NASA satellite in an area currently being cleared of degraded primary forest for oil palm in PT Tunas Sawaerma, a concession in Boven Digoel district which is also owned by Korean conglomerate Korindo (see Figure 5). Again, Landsat satellite images confirm the existence of fires within this area of recent development. An image from 24th October clearly shows a large fire within the area under development. 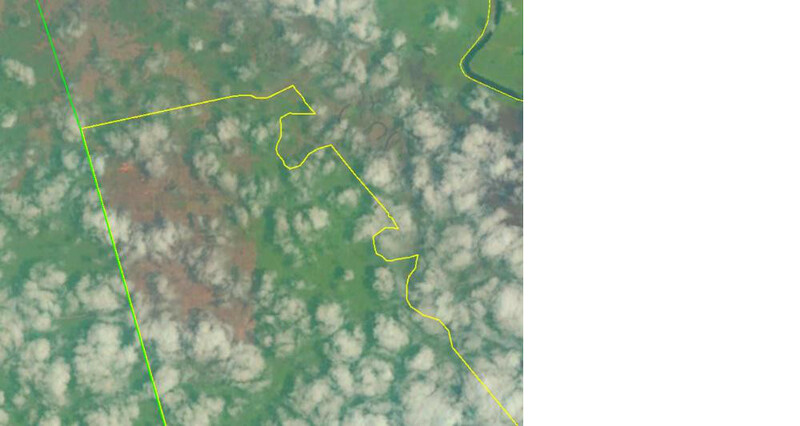 Comparison with an image from the beginning of September shows that the area concerned remained forested previously, though new plantation roads had been cut (see Figures 6 and 7). Many of the fire hotspots in the Korindo concession are on peat soils, as is some of the area newly cleared by fire during September/October 2015 (see Figure 5). Sources: Background – Degraded (light green) and intact (dark green) primary forest, from Margono, B. Primary forest cover loss in Indonesia over 2000–2012. Nature Climate Change,doi:10.1038/nclimate2277; spots – NASA MODIS fire hotspots, “NASA Active Fires.” NASA FIRMS. 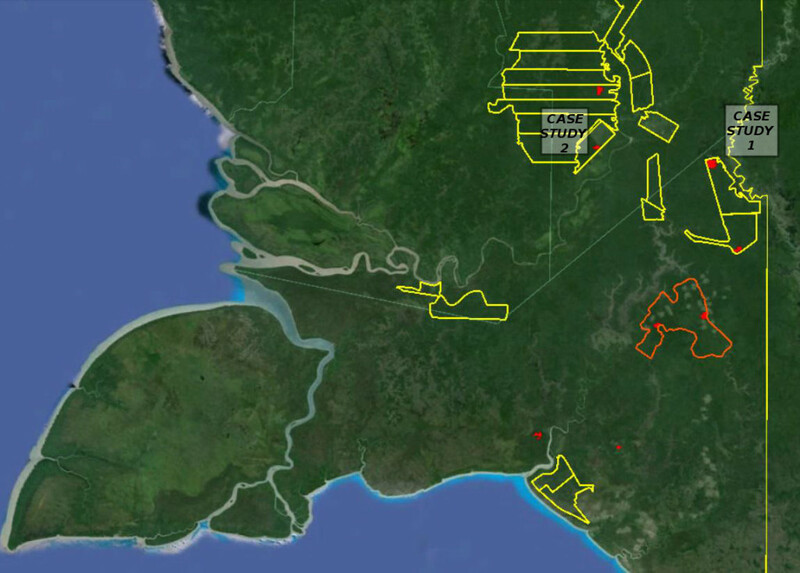 Accessed through Global Forest Watch on 15th November 2015; concession boundary – Ministry of Forestry GIS portal map of Forestland releases, accessed 9th November 2015; extent of new oil palm development (red/orange line) – based on analysis of Landsat satellite images from 25/1/15, 6/9/15, 24/10/15. 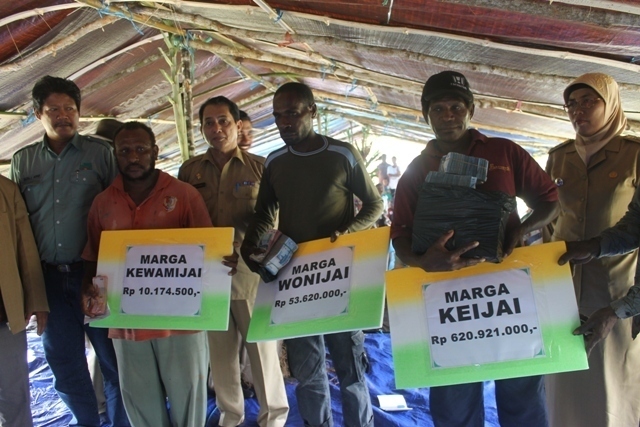 This entry was posted in Merauke News and tagged Bookmark the permalink. Comments are closed, but you can leave a trackback: Trackback URL.